Did you know that bees pollinate one out of every three bites that we eat? Honeybee populations are troubled, which could spell disaster for the food supply. One Bay Area social entrepreneur, environmentalist, and Dad has created a simple solution that is sure to brighten and beautify the future: Seedles. Seedles, which are seedballs comprised of clay, compost, native & GMO-free seeds, natural pigments, and water, are brilliantly beautiful and a fun way to promote a sustainable food future. Seedles wants to make helping the environment as easy as possible, so they designed their seedballs to simply grow and root into the soil after it rains; you can literally throw them and grow them. 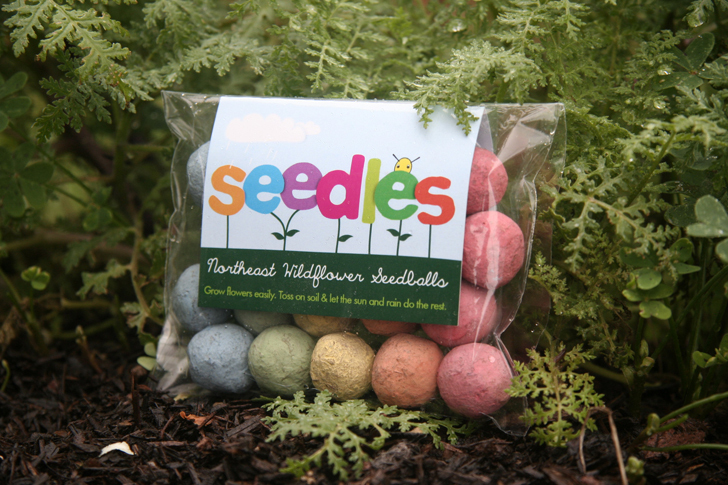 Each Seedle can grow between five and ten wildflowers, so kids will love being able to see their part in helping to “grow the rainbow.” These easy-to-spread seedballs are genius, and we especially love the fact that Seedles are packaged according to region, so your Seedles packet will only include wildflowers native to your area. The eighteen months that the Seedles crew spent crafting their products is evident in the details: Seedles include hot pepper powder to deter ants, slugs, and other insects from eating the seeds, but they are still safe to touch since the pepper powder isn’t in the coating. They are also sized to eliminate wasting seeds or competition between the seedlings, and they include three types of compost to create a rich and fertile foundation. In addition to the wildflower seedballs, Seedles also features “thyme bombs,” a set of 7 easy-to-grow and organic herbs such as basil and peppermint. We love the idea of incorporating Seedles as pay-it-forward party favors or becoming a classroom superhero and gifting Seedles, eco-friendly pots, and related classroom resources. Seedles started as a successful Kickstarter campaign with the goal of growing a million wildflowers, but CEO Chris created a machine to help make Seedles in larger batches and has accordingly increased that goal to one billion wildflowers. That’s what we call making the world a more bee-yoo-ti-ful place! Thanks for helping us spread the word Marni. We're really excited to be able to work with kids all over the U.S. to help bring back the bees ... one wildflower at a time. We hope everyone has as much fun growing their Seedles as we have making them ... the color therapy we get weekly is induces lots of playful happy smiles. what a great idea, creative and inventive. Just throw on the ground and let them grow. Live on the coast in southern SC near brackish water, mostly sand-based soil. Will they grow here? Did you know that bees pollinate one out of every three bites that we eat? Honeybee populations are troubled, which could spell disaster for the food supply. One Bay Area social entrepreneur, environmentalist, and Dad has created a simple solution that is sure to brighten and beautify the future: Seedles. 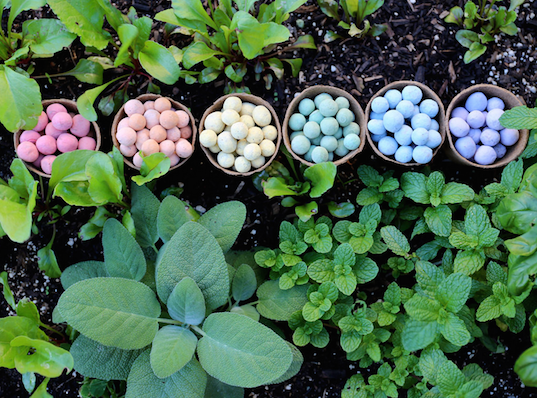 Seedles, which are seedballs comprised of clay, compost, native & GMO-free seeds, natural pigments, and water, are brilliantly beautiful and�a fun way to promote a sustainable food future. Seedles wants to make helping the environment as easy as possible, so they designed their seedballs to simply grow and root into the soil after it rains; you can literally throw them and grow them. �Each Seedle can grow between five and ten wildflowers, so kids will love being able to see their part in helping to "grow the rainbow." These easy-to-spread seedballs are genius, and we especially love the fact that Seedles are packaged according to region, so your Seedles packet will only include wildflowers native to your area.